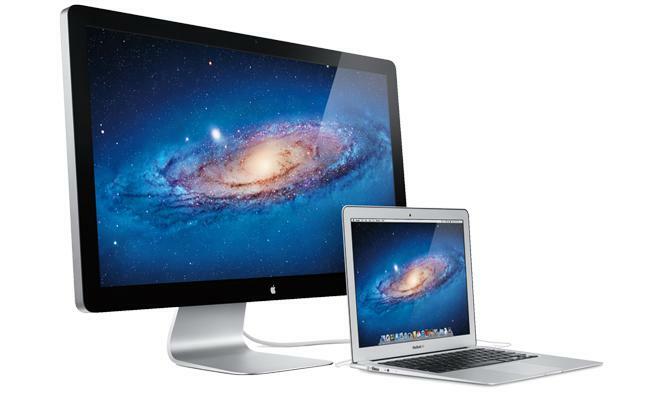 Third-party retailers are reporting stock-outs, or near stock-outs, of Apple's 27-inch Thunderbolt Display, once again fueling rumors that the company is preparing to release an upgraded Retina display model. A number of resellers, including Adorama, Fry's, CDW and MicroCenter are all sold out of the Thunderbolt Display, reports MacTrast, while PowerMax MacConnection and others are running low on inventory. The supposed stock-outs mirror an identical situation seen in February, when even larger companies like Amazon and J&R noted Apple's Thunderbolt Display was sold out. At the time, it was speculated that Apple would soon reveal a thinner version of the product more in line with the redesigned iMac. While it is unclear whether Apple is indeed preparing a successor to the current Thunderbolt Display model, which hasn't been updated since its debut in 2011, a high-resolution wallpaper discovered on Apple's servers hints at possible refresh. The image in question is the blue-and-green wave background seen in Apple's OS X Mavericks promotional materials. At 5,120-by-2,880 pixels, the wallpaper has dimensions exactly twice that of the current Thunderbolt Display and 27-inch iMac.